Mt. Konocti - Now open for daytime hiking! Leave a legacy of open space by donating to the Mount Konocti Park Sponsorship Program today! Mt. 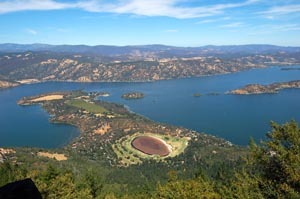 Konocti .... Lake County's ancient towering volcano provides a backdrop to California's Clear Lake. Home to falcons and other raptors, sacred to Native Americans, and the subject of legends, the mountain is one of the few landmarks ever-visible from most locations throughout the county. In private hands since the mid-1800's, few have enjoyed the breathtaking beauty seen from the top. Lake County now has the once-in-a-lifetime opportunity to acquire 1520 acres, putting much of the mountain into public hands for perpetuity. Lands for many purposes - for reflection, for hiking, for enjoying nature. You can make a difference with your tax-deductible donation. 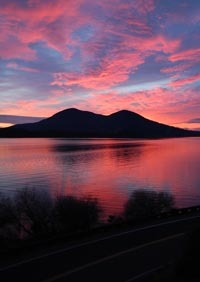 Act now and preserve this magnificent icon for now, and for future generations . . . . Copyright 2008 www.PreserveKonocti.org. All rights reserved.